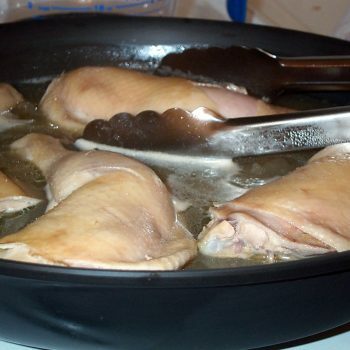 This involves partially submerging food in simmering liquid, and cooking by a combination of the hot liquid and he steam rising into the covered pan. The foods are generally thin, delicate and quick to cook. Poaching is particularly suitable for delicate food, such as eggs, poultry, fish, abd liver. Keep the heat low and poaching time to a bare minimum.